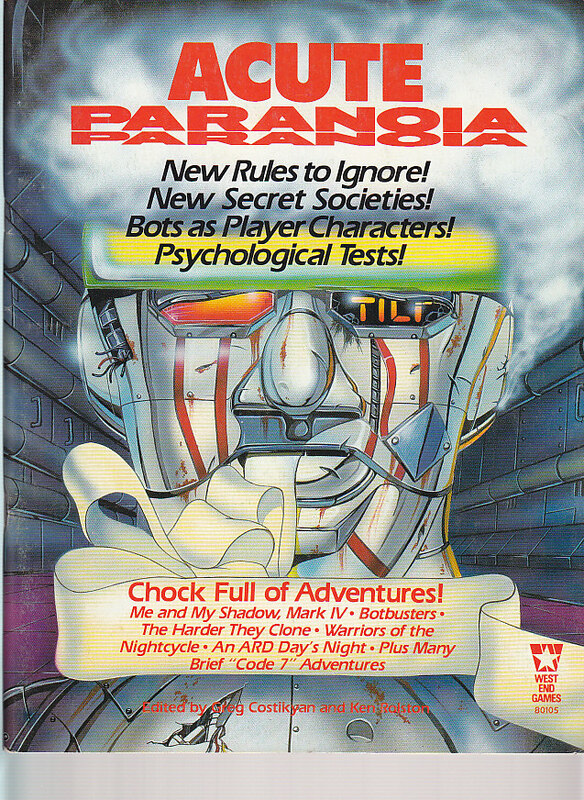 "Features rules for robot PCs and NPCs, plus new secret societies, several adventures (including the mega-adventure Me and My Shadow, Mark IV), and several short adventure ideas." 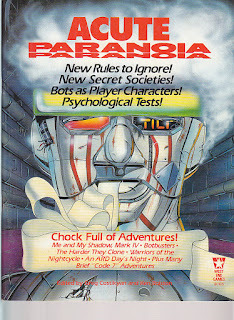 "Pandemonium is a role playing game that takes place in the weird world of the Tabloids - those tacky looking newspapers you see in the supermarket but are afraid to buy because you don't want your friends to think you actually believe Elvis is still alive, or that evil aliens from a far galaxy have come to Earth to kidnap our women. So you sneak a peek while you're waiting in the checkout line but never actually get up the courage to buy a copy, because what would the neighbors say? Well, here's your chance to find out what you've been missing!" "This is a GM shield for Palladium First Edition. Simple three-fold, light card stock game screen with tables printed on 5 of the 6 faces." "Mutants in Orbit is a Palladium Books Adventure and sourcebook for After the Bomb & Rifts developed by James Wallis and Kevin Siembieda. 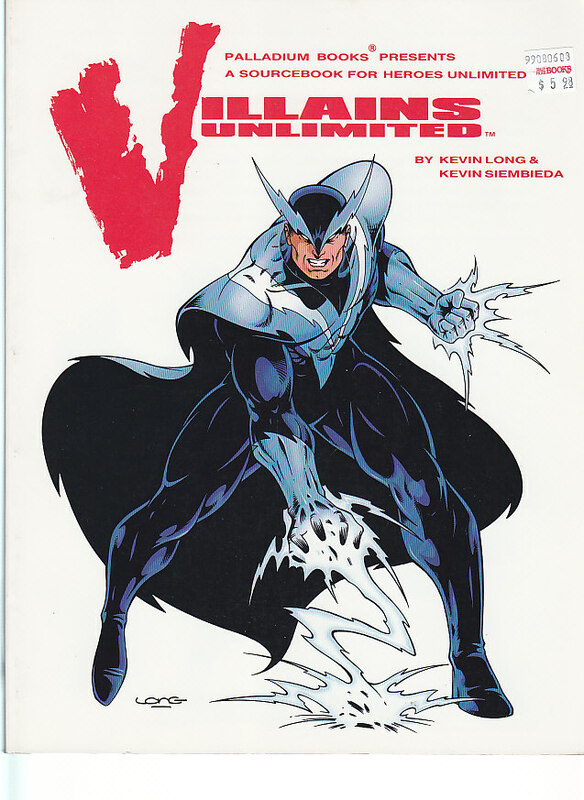 The original copyright came into existence in 1988 and is owned by Kevin Siembieda. The book deals with life of the space colonies After the Bomb. The setting is on the same time scale as the After the Bomb and Rifts, only from the space colonies' point of view, but is in no way limited to that use." "This 120 page sourcebook is divided into two sections, one for After the Bomb and another for Rifts. The startling answer to the questions of what lays within Earth's orbit, on the moon and Mars. A.R.C.H.I.E. Seven, the Cyberworks corporation, CAN Republic, Virtual Reality defense system, three new Glitter Boys, the steel dragon, bots, killer satellites, mutants, monsters and more!" New spells from mages such ads Daltim, Darsson, and Myrl. Fell creatures - the Tome Guardian, the Disenchanter, and the Scalamagdrion. Details of more than 40 spellbooks - appearance, history, the magic they contain, and what is known of the fates of their makers. And just for fun - Elminster's very own traveling spellbook! "All this could have been avoided, of course... If the handful of heedful folk in the worlds'd listen to me but a few moments more, much trouble could be avoided - and, I suppose, much high adventure. Hmmm... perhaps 'tis the doom of humans to always rush in heedless of the costs - and to open and read every old, crumbling book they find." -Elminster"
"You were absolutely certain that the priceless painting you found on the cart was an original one-of-a-kind piece -- and so was the one just like it. Investigating this matter led you to the giant vineyard and a meeting with an art dealer, whose assistant looks astonishingly like one of the brigands you killed earlier on the way here. Now you've discovered the dead body under the floorboards of the meeting room, and it's the same man you just spoke to five minutes ago in the lobby. What's going on? And why is your companion, the man who paid you to investigate all this, drawing his sword on you and grinning wickedly?" "Devious secret agents, subtle alien invasions, ancient conspiracies, the secret of human nature, drooling psychopaths, weird science, a quick but painful death -- who knows what you may find when you play Over the Edge? For the first time, the surreal undercurrents of fiction, cinema, and television have come to roleplaying, and Over the Edge is the game that can take you where you've never been before. * Free-form Character Creation: Define your character the way you want to, without the limits of skill lists, random rolls, and artificial limitations. 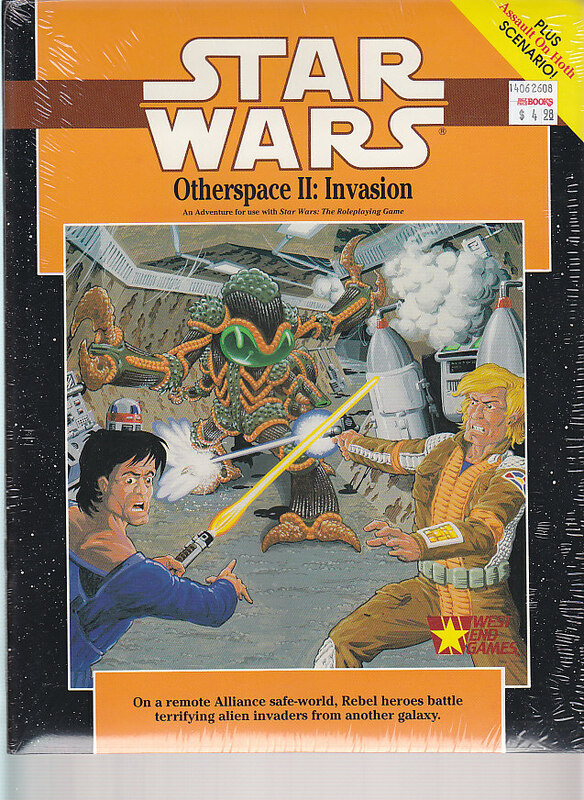 The rules favor character development over mechanics. * Open Setting: Anything goes on the chaotic island of Al Amarja. If it troubles your dreams, if it scares you, if you hope it isn't true, it's waiting for you Over the Edge. Players can never be sure what they're up against, who is on their side, and why. * Focus on the Story: Easy, open-ended mechanics allow you to spend more time developing your character and your plots, instead of crunching numbers. The GM's chapters include numerous story ideas and plenty advice for better gamemastering. * Easy To Get Started: Three beginning adventures introduce the GM and players to the wild world of Al Amarja and make the first sessions easy to run. * New in the Second Edition: the mother of all charts on what each Al Amarjan conspiracy thinks of all the other ones; updated references include all published supplements; improved layout and graphic appearance." "In a remote, little-traveled corner of the galaxy, the Alliance safe-world of Stronghold floats serenely against the bloody backdrop of rebellion and Empire. Here, families of Alliance warriors hide, safe from Imperial attack. But something has gone wrong wrong on the safe world. Terribly wrong. There has been no contact with Stronghold for weeks. No comm reports, no ship traffic. Nothing. It is as though the entire planet has vanished. Six Alliance personnel race to Stronghold to find out what has happened to the planet - and to their friends and loved ones hiding there. Six rebels - against the Invasion! 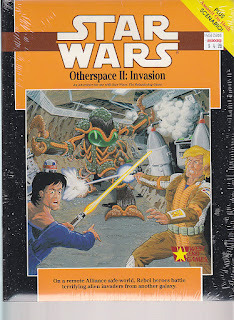 Also included in this module is a Star Wars: Assault on Hoth Scenario." A complete campaign setting: Rokugan, the world of the Legend of the Five Rings Trading Card Game." "Orcfest is the perfect start-up adventure for the new 3rd Edition of the Dungeons & Dragons roleplaying game. It's a rollicking quest that culminates in a climactic battle against an orc war chief and his army, paired with a step-by-step guide to character development, die rolls, combat, and more. As you play, both the game master and the players receive advice and hints to explain the game for first-timers. Even experienced players will find tips for faster, more streamlined play - tricks that took the rest of us many years to discover!" The Silver Age of comics has returned, with this dynamic new setting book for use with M&M Superlink, the Hero System, and Silver Age Sentinels! Within these pages you'll find everything you need to know about the universe presented in the fictitious Omlevex Comics during the 1960s. Behind-the-scenes information about the Omlevex Comics Group! Get the scoop on the writers, artists, and creators behind one of comicdom's greatest companies of the 1960s. Through interview snippets and facts from folks who were there, the happenings and goings-on at the legendary Omlevex madhouse will come to life in thriving vivid detail. Extensive Overview of the Omlevex Universe! Learn about Metazon, a cluster of islands located off the coast of Georgia where most of the world's superhuman activity occurs. You'll find out all the secrets of omlevex, the mysterious mineral responsible for the bestowment of powers upon humans. Dig deep into the setting's history with our exhaustive timeline of past events. Bios for numerous heroes and villains! Nearly 50 characters from all five of the major Silver Age Omlevex titles are profiled. You'll even find "modern-day options" that allow you to use the characters in contemporary campaigns." "The storm-stuff is not matter as we know it, and beyond immortal control," the Hierarch sighs, "I fear we are doomed." It appeared only a few weeks ago - a swirling gray mass of incalculable size. And in in its center, an eye. A humanoid eye. Now the storm threatens the very era of immortal rule. The first Immortal Adventure pits your party against the multiverse in a desperate struggle to find the essence of life. This adventures is like nothing you've played before." "The corebook to the Obsidian universe, this book has all the rules, mechanics, history, setting, and players that are used in the game. Obsidian is set in the 2299, as a desperate humanity wages war against the manifested legions of Hell itself. In the final battle, the last vestiges of mankind construct a fortified city to hold the Daemonic hordes at bay. Within this city, massive corporations vie for power, Daemonic Kults carve a bloody swath through its citizenry, and technology has surpassed the limits of the flesh. Take care when choosing your allies, even more when choosing your enemies. This is the Zone. Obsidian allows the player to take control over any type of character, from the infernal kultist to the self proclaimed messiah. In between are littered a menagerie of corporate soldiers and cybernetically-clad street assassins. Included in the book are rules to create Daemons from scratch, security systems, corporate construction rules, and of course all the tools necessary to make and play an Obsidian character." "The bulk of the City of Penance is a madly stacked and sprawling ruin, only superficially explored by the relentless rafters and treasure-seekers of the surface world. Every home in the city has a hundred others lost beneath it, and every city street stands atop an incredible three-dimensional maze of corridors, alleyways, and crawlspaces--a maze where time has left nothing unchanged, eroding and distorting the framework of magic and even the laws of physics themselves. - New magic items, monsters, and spells"
"Beyond the most populous city on the Forge lies a vast, uncontrolled expanse of rolling grasslands, scattered crags, and light woods. In strong contrast to the rest of the world, where nature stands in opposition to intelligent life, the bountiful land here provides a lush wealth of resources upon which the great cities have come to depend. Powerful forces vie for control over this abundant domain, as ruthless bloodlords of the cities clash against the deep-rooted druids of the wilds, hardened armies from the west, and even mysterious visitors from the depths of the northern oceans. - New magic items, monsters, spells, and weapons"
"The peninsula of Wa is no place to visit. The land is poor, the people wary and suspicious. Yet this quiet backwater has been the site of strange disturbances - mysterious disappearances and omens of dire events to come. Why do the animals of Wa disappear, only to return a short while later? Who are the Blue Kumi bandits, and why are they so active? Why do the black geese fly into the Jusofu Mountains? And what fell creature lurks along the southern coast of Wa? Test of the Samurai will take the players across the Wa peninsula and to the unknown land of Qui. They will encounter such legendary beasts as the feng huang (phoenix) and the chi'-lin (unicorn) as they attempt to discover the secrets of Wa. 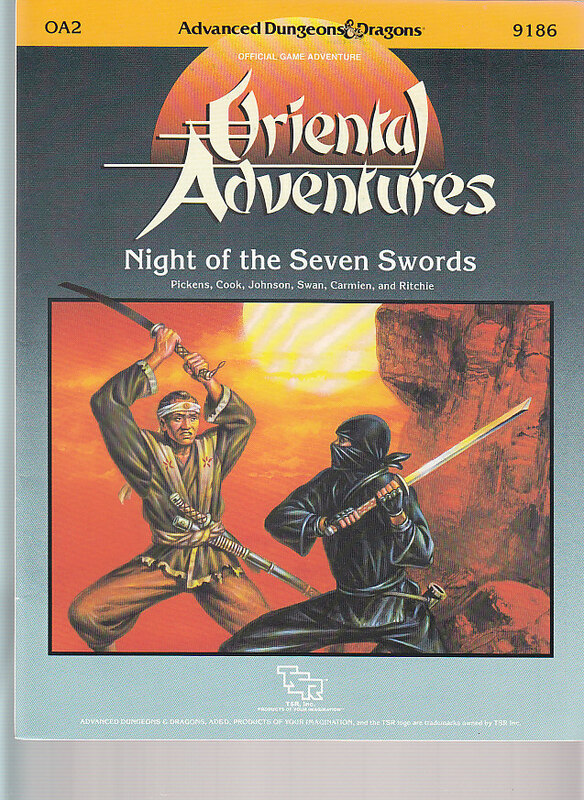 Test of the Samurai is a scenario for the Oriental Adventures supplement to the AD&D game. It is set in Kara-Tur, the oriental world in the Forgotten Realms. Although Test of the Samurai follows the events of module OA6: Ronin Challenge, it is an independent adventure for five to eight characters of levels 6-9." So you and your companions are bound for the island of Akari, a small pebble in the Celestial Sea. There you will find a land rich in ancient lore and guarded by the sword of a spectral samurai - Ochimo, the spirit warrior. Yet this is only the first taste of adventures that await you. Ochimo: The Spirit Warrior is an adventure for characters of levels 5-7 and uses the AD&D Oriental Adventures rule book. The module includes descriptions of Akari Island, as well as much information on the lifestyles, attitudes, and history of the most civilized nation in the world: Shou Lung"
"While Maeshi province revels in the festival spirit, clouds gather over the political scene. Two warlords are vying for control of this otherwise peaceful place, and you are guest of one of them. Sun Temple officials have offered complete support to the faction which successfully travels to Ito-jo Castle (said to hold relics of great importance to the Sun Temple), brings them back safely, and returns them to the Inn of the Globefish. Is the castle really haunted? What lies in the caverns beneath it? Will Korimori's troops discover your plan and try to wrest the relics from you, should you even get that far? What will you find at the Inn of the Globefish? Come, honorable stranger - the Seven Swords await!" "110th Day: The gale nae stops for twa days. My ship is driven before it and the magus is as helpless as a wee babe. Akito names the winds tai-fun in his heathen tongue...."
Drawn by the lure of adventure and riches, a crew of seamen sails valiantly into uncharted seas. In the squalid dens of the port districts, tales hint at a land of untold riches across the waves. But getting there is only the beginning. Across the waters lies Kozakura, a land of mystery and danger. There you will discover new cultures, strange values, secret powers, and fabulous terrors. For Kozakura is a land of Oriental Adventures. 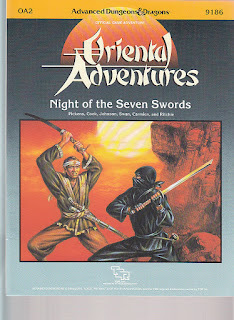 Swords of the Daimyo is the first module designed for use with the AD&D Oriental Adventures rule book. Swords of the Daimyo includes descriptions and maps of the island of Kozakura, detailed information and maps of Miyama Province of Kozakura, and a series of adventures to introduce old and new player characters to the intrigues of the Orient." "A cold, foul wind blows through the city of Dorona. The rats lift their noses from the dirty streets in anticipation, for they know the smell of Death when it comes to town. But this wind is human and it bears a name - the name of Shadar Al-Meryk. Shadar Al-Meryk is a name few know, and fewer still speak aloud. Shadar Al-Meryk, the necromantic wizard. Shadar Al-Meryk, the midnight robber of graves. Shadar Al-Meryk, the worshiper of dark and ancient Gods. He has come to the city of Dorona this storm-tossed evening for a reason. He is searching for something. Something that is not his, but will soon be." An adventure module for 4-6 characters of levels 7-9. "Resources for the Nephilim players and gamemasters, such as: new past lives, new Metamorphosis (and a new system based on emotions) and new simulacra." These convenient referee aids contain all information needed to run each non-player character and his, her or its personal background. The sheets have been organized under specific headings and important, oft-consulted information is boxed in eye-catching, easy-to-find displays. These records contain information on the character's abilities, combat skills, description, possessions and background. Compact, but complete, their small size provides easy handling and more sheets. If you enjoy this product you will want to discover AD&D PLAYER CHARACTER RECORD SHEETS and other quality products from TSR, those Game Wizards." "When the storm comes in with its teeth, teeth, teeth . . .
Black clouds build on the horizon with supernatural swiftness as the light of day drains away like a guttering candle. As the wind screams and sea spray blinds the eyes, the masts splinter and the deck heels over, a plaything of the storm. A nightmare shark hunts the murky ocean for all that succumb to the hammer of the winds. Can anyone survive the Tempest of the Deep Mother? Night of the Shark is the second part of an adventure trilogy featuring the evil sahuagin, deadly sea devils in pursuit of an ancient relic known only as The Stone Which Abides. This adventure can be played independently, or it can be linked together as part of the adventure series that began with Evil Tide and concludes with Sea of Blood."